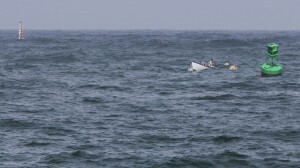 After last years dramatic race in Noyo River for the Noyo Cup, this year’s race will be out in the ocean. The course is 1.1 miles out into Noyo Bay and around the green bouy. This year the ocean conditions added another challenge to what has become a local event. Boats provided by The Lost Coast Chapter of the Traditional Small Craft Association.The race was marshaled by Stan Halvorsen.